Food. It's a passion in our home. So many of my cherished memories have occurred while cooking, baking and gathering around the table for a meal with my family. So, when my daughter was recently diagnosed with Celiac Disease, it was a definite learning curve for us all. We have literally spent hours pouring over information on Celiac's, Gluten, and GMO's (which can also present issues for those with Celiac's). It's a complicated disease, with a very long list of dietary no-no's and there's a TON to learn. Because Celiac's is so complicated, when my daughter was first diagnosed, baked potato's became her "safe zone" when dining out, if other gluten-free options weren't available. However, we soon learned that "trace" gluten from the preparation around other foods containing gluten could make even her "safe" food choice an issue as well. I won't even pretend that it's been easy. Chicken fingers, cupcakes, pasta .... all of her favorite foods were suddenly off limits [unless prepared specially with gluten-free ingredients] which was A HUGE lifestyle adjustment to try to explain to a 7 year old (and implement immediately). 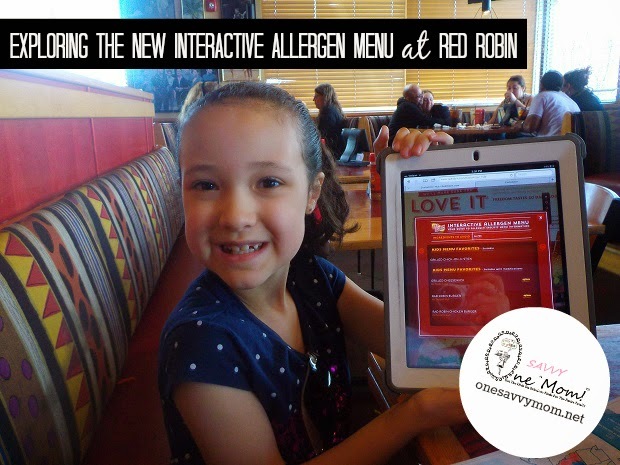 Because it has been a difficult adjustment for her over the last few months, her eyes were wide with excitement when Red Robin recently introduced an Interactive Allergen Menu, and invited us to check it out. First, I have to note how appreciative I was to the waitress for being so knowledgeable about gluten allergies. We pulled up the Interactive Allergen Menu on the iPad when we sat down, identified her allergen, and it automatically produced a menu with suitable options -along with a list of "suitable with modifications" options for her to choose from. The waitress also let us know which modifications were available for her specific allergy. A "Gluten-free" fry station for steak fry preparation. Grilled in place of breaded/fried chicken breast for her choice of the "Rad Robin" kids chicken sandwich. Our daughter really enjoyed being able to eat her favorite Red Robin steak fries again! The waitress even made sure to have an additional basket of gluten-free fries ready for her upon request (Red Robin offers BOTTOMLESS Steak Fries). It was a wonderful experience being able to dine out with the entire family again. We have avoided eating out since our daughter's diagnosis so that she wouldn't feel excluded from the experience. 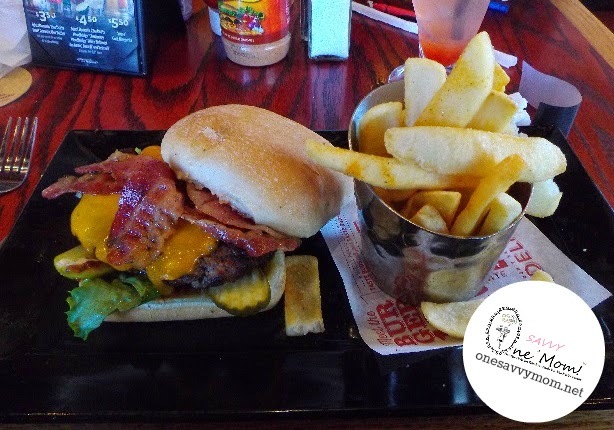 On a side note - my husband took the opportunity to try one of the new "Red Robin's Finest" Smoke & Pepper Burger's (see below) and he say's that it's hands-down the best burger that he has ever had - a definite must-try. It's great to know that Red Robin now offers gluten-free options for our daughter. It's such a great place to dine out with the family! Delicious food, fun atmosphere, and free balloons for the kids. What more could a gal ask for? 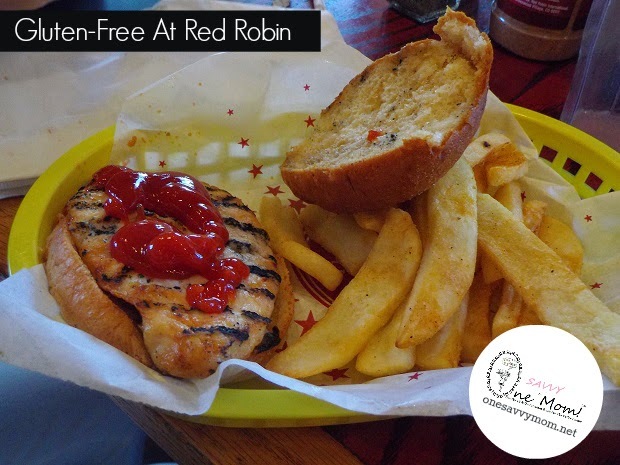 To check out the new Interactive Allergen Menu at Red Robin, you can view it online by visiting the Red Robin Nutrition Customizer online or download the free app for iPhone or Android. **Disclosure: The Red Robin information and gift cards have been provided by Red Robin. 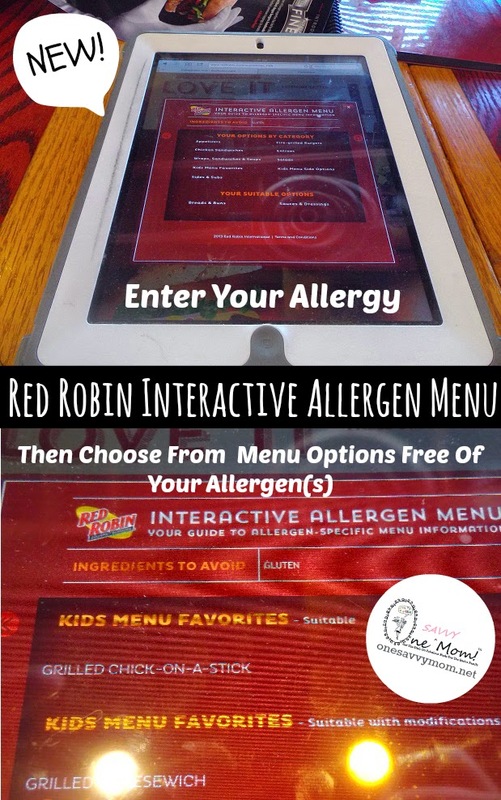 Ready to test out the new Interactive Allergen Menu at Red Robin for yourself? Red Robin is offering a $25 Red Robin Gift Card for (1) One Savvy Mom reader. Enter on the Giveaway Tools Form Below.